Established in November 2017, Plastic Free Truro works to help businesses, community groups and individuals find ways to reduce the environmental impact of single use plastics. Plastic Free Truro is a local community group set up as an arm of the Surfers Against Sewage Plastic Free Coastlines campaign. In summer 2018, that campaign was rebranded by Cornwall based Surfers Against Sewage – the leading UK marine conservation charity – as Plastic Free Communities. This reflects the fact that action is as relevant – perhaps even more relevant – to those inland, as that is where most people live. In June 2018, Plastic Free Truro gained Approved Plastic Free Community Status from Surfers Against Sewage. While a small number of towns have successfully been Certified, Truro is the first city in the UK to do so. This certification recognises the work Plastic Free Truro has done so far in working with several local businesses and community groups to commit to a certain number of tangible action steps to reduce their use and / or sale of single use plastic products. While this is a great achievement and demonstrates progress, Plastic Free Truro are just getting started, and continue to speak with groups in and around the city, as well as local business owners who want to reduce their environmental footprint. They are also keen to hear from groups and individuals who would like to partner with them or lend their support as volunteers. 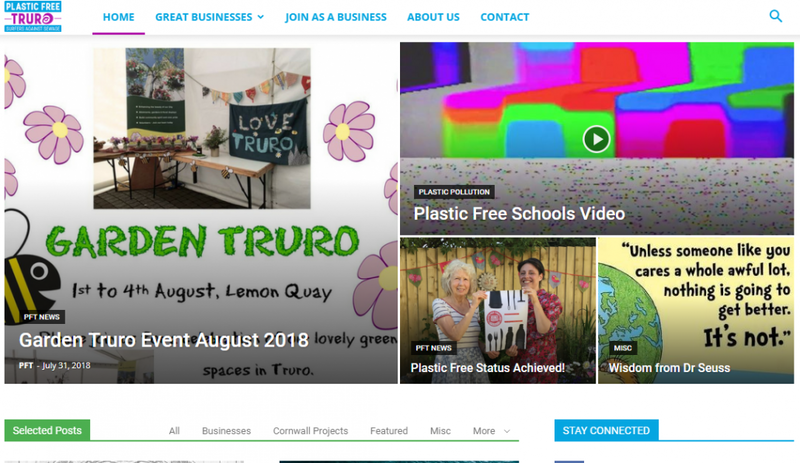 Plastic Free Truro have launched a new website at www.plasticfreetruro.org where you can learn about their work and get involved. Companies who join the campaign are also able to use the official Plastic Free logo that demonstrates their commitment to ethical, environmentally friendly business. If you live elsewhere in the UK, the Surfers Against Sewage website has an interactive map at https://www.sas.org.uk/communities-near-me/ where you can find dozens of local community groups the length and breadth of the country.